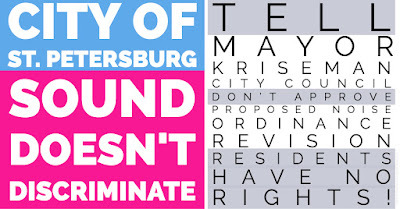 BAY POST INTERNET: Sound doesn't discriminate and residents have no rights in St. Petersburg! There has been no real discussion on the noise ordinance from Mayor Kriseman. 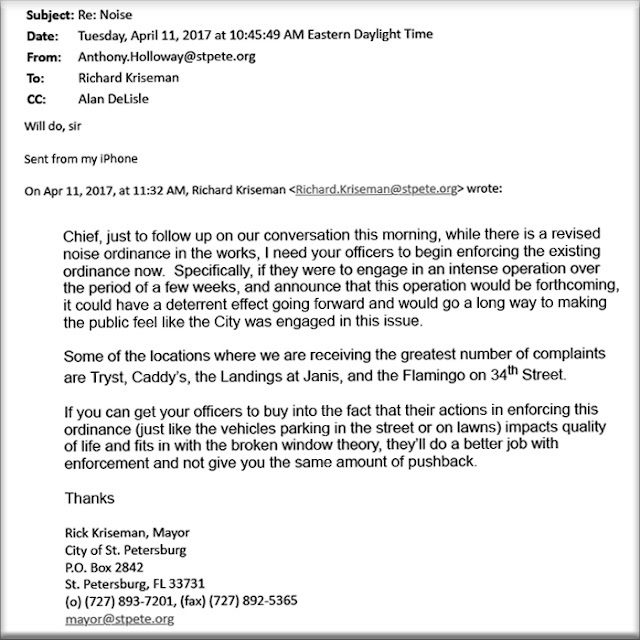 Considering Mayor Kriseman emailed Police Chief Holloway to ask him to enforce the noise ordinance for two weeks, the time for an honest noise discussion is way past due. The Mayor, and City Council Members do not live near a noise source. Mayor Kriseman is noticeably absent on the noise issue, unless there is a camera so he can say something non whimsical about getting along. No one on City Council is asking the hard questions. Seems they just want this to go away? My response is, "Sound doesn't discriminate but Mayor Kriseman and City Council are discriminating against residents when it comes to noise." 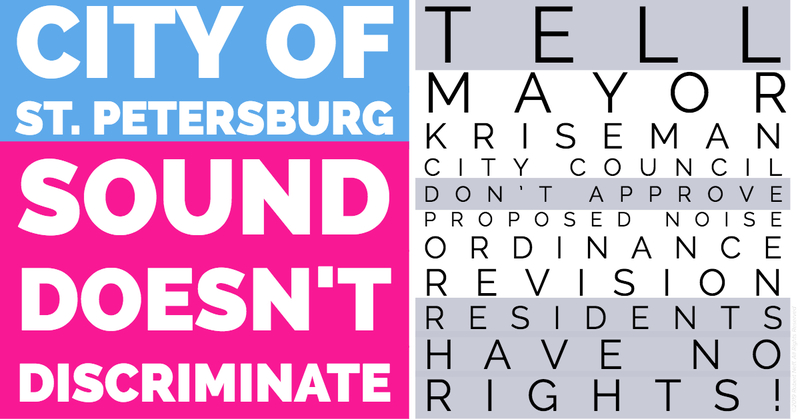 Residents have no rights in St. Petersburg! a. Why is the noise ordinance standard for violation different for sound between a residence to another residence, vehicle to a neighborhood, or a business to a residence? Sound pressure could care less if you are in a residential or non-residential zone. b. If sound is impacting a person in the home or on the street, what difference does the time of day make? Time does not discriminate. c. How can someone live too close to a bar and there be no violation? The sound pressure is much greater if you live closer to the source. The City’s noise ordinance does protect residences in their home if they live too close. The City is responsible for residences who were forced to move, especially when their health and welfare were at risk. What about the people who cannot afford to move and have to suffer? The current and revised noise ordinance state different distances for residential, non residential, motor vehicle, and boat. A violation should not have a different distance for a resident call on another residence or resident call on a bar? That is, a resident who calls the police in a residential area for noisy neighbor has a lesser distance requirement than a resident who calls the police to report noise for a bar, restaurant or cafe, who may be much louder than a resident. The time, day or night, should not be a consideration, because the sound pressure does not change whether its afternoon or night? Noise does not discriminate and does have a negative medical impact on adult and kids health. Why has the City refused to hire a medical expert to present to City Council’s Public Services & Infrastructure Committee? 2. City did not conduct a cost analysis for all three noise ordinance revisions and properly model the costs. Request the city develop a cost model and present to PS&I before May’s meeting on the revision. The City did provide a cost to implement the decibel standard, but the City did not provide provide the current costs to have two officers and a vehicle respond to a noise call. Thus, the $334,852 price tag to implement the decibel standard probably resulted in Council’s sticker shock, and greatly influenced their decision to chose Option #1. 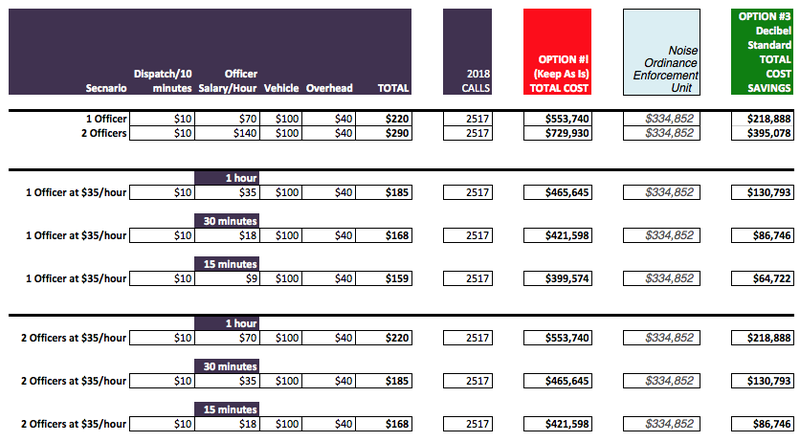 Here is a crude data model I built that suggests the cost saving to implement Option 3’s decibel Standard could be over $86,000 to over $200,000. Certainly the City could refine the data model with a detailed cost breakout. In addition, the Noise Ordinance Enforcement Unit cost has no daytime scheduled. Many of the infractions are daytime and on weekends. 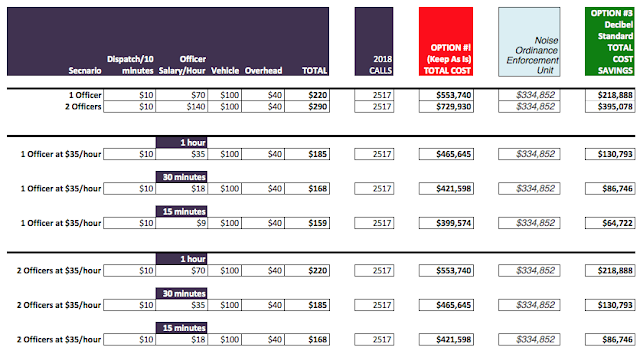 The City’s cost does not consider reduction in repeat calls, and for 2018 would be reduced by 46%. 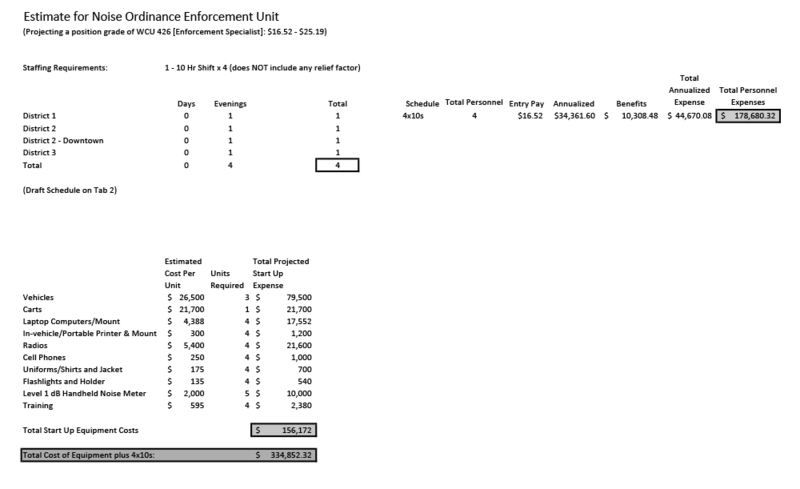 Here are the City's costs for the Noise Ordinance Enforcement Unit. 3. Why is there no community outreach and education for the current and new noise ordinance? The "Plainly audible" standard and the time and distance are the three main issues with the proposed noise ordinance revision. The decibel standard would correct these issues. 4. When the City approves/rejects the noise ordinance revision, how will the police maintain the warnings and citations? Will this be available to the public on the City web site? Police do not maintain noise reports that dig into the data or conduct trend analysis. 5. How will the new noise ordinance’s performance be measured? This is important for residents to understand how our tax dollars are being utilized. Will there be updates every three months? Six months? 7. Will the Police Department enforce the noise ordinance year-round and not just for two weeks? 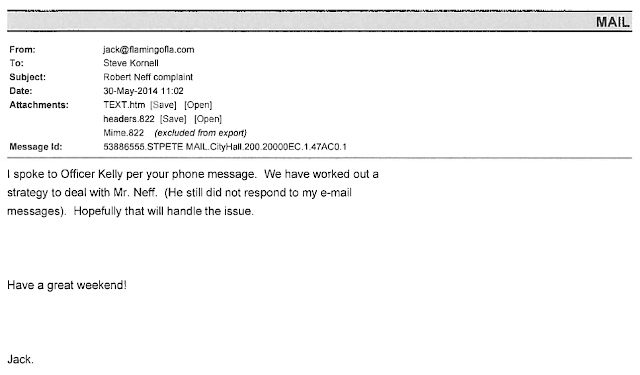 Read the Mayor Kriseman's email to Police Chief Holloway to understand what the Mayor did. 8. Will Police Officers work with Council members and bar owners and business districts to develop strategies to deal with residence who call the police to report noise? Internal Affairs is OK with this. Why am I not surprised? Here is the Mayor's email to Police Chief Holloway. You're doing a great job Robert- stay on top of them!